As you know, Yahoo has decided to shut down AllTheWeb by redirecting AllTheWeb.com to Yahoo Search. I guess Google isn't too happy about that decision, because if you search for [yahoo search] in Google, Google ranks AllTheWeb.com above Yahoo Search! The same search in Bing or Yahoo do not return AllTheWeb in the top results. 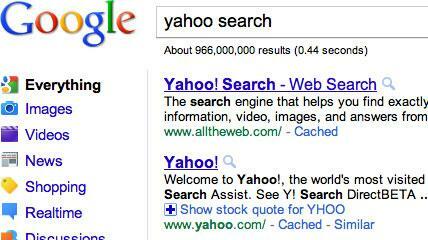 So why is Google ranking AllTheWeb for Yahoo Search? Well, because Yahoo decided to use a "temporary" redirect, a 302 redirect - as opposed to using an "permanent" redirect, a 301 redirect, from alltheweb.com to search.yahoo.com. How I can check back link of any site ?